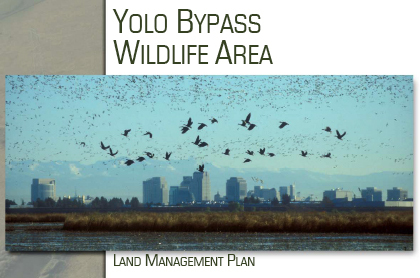 The Yolo Bypass Wildlife Area Land Management Plan was developed in 2008 by the California Department of Fish and Game and the Yolo Basin Foundation. The Yolo Basin Foundation initiated the Yolo Bypass Working Group in 1998 under a CALFED Ecosystem Restoration Grant. This ad hoc stakeholder group is very successful and continues to meet as needed. Over 40 people representing a wide range of stakeholders with an interest in the Yolo Bypass regularly attend these meetings. Participants include landowners (farmers, ranchers, duck hunters), Department of Water Resources, Central Valley Flood Protection Board, CA Department of Fish and Wildlife, US Fish and Wildlife Service, Natural Resources Conservation Service, Dixon and Yolo Resource Conservation Districts, Sacramento Area Flood Control Agency, Yolo County, City of West Sacramento, City of Davis, California Waterfowl Association, Ducks Unlimited, Sacramento Yolo Mosquito Vector Control District, American Rivers and others. The following studies were conducted under the direction of Yolo County with assistance from Yolo Basin Foundation as a way to provide technical information into the development of a series of actions that would make up the Yolo Bypass Conservation Measure in the draft Bay Delta Conservation Plan. Yolo County Board of Supervisors’ resolutions related to the Delta and Yolo Bypass are also included. To access any of these studies, please click the following link to the Yolo County Delta eLibrary. Yolo Basin Foundation is the designated project leader for the Yolo Bypass Integrated Project of the Yolo County Integrated Regional Water Management Plan (IRWMP). Water Resources Association of Yolo County website: Yolo County IRWMP. The Yolo Bypass Management Strategy (Management Strategy) presents a locally based concept for the future of the Yolo Bypass (Bypass). A Framework for the Future: The Management Strategy is the culmination of a stakeholder-based project funded by the CALFED Bay-Delta Program (CALFED). Chapter 1 presents general information about the location of the project area, background about the project process, and descriptions of past and present projects that are related to the Bypass. Chapter 2 presents a description of existing conditions in the Bypass, with an emphasis on existing land and water uses and historic and recent flood flow and low-flow hydrologic data. Chapter 3 describes several assurances and related issues that landowners need addressed to feel more comfortable about considering habitat-related land use changes in the Bypass. Chapter 4 presents a set of realistic habitat recommendations prepared by the Yolo Bypass Working Group (Working Group), including an analysis of habitat benefits, ways in which such ideas could match with CALFED is targets and actions, and constraints that could prevent implementation of such recommendations. Chapter 5 presents conclusions and recommendations of several technical studies that will likely be necessary to achieve future implementation of potential habitat enhancement ideas.